As an alternative to a conventional four-wheeler, one Cumbrian sheep farmer is seeing the benefits of a six-wheel ATV. But how does the quirky concept compare to a quad? James Rickard gets a user’s view of a Can-Am Outlander 6x6. User's view: How does a six-wheel ATV compare to a quad? 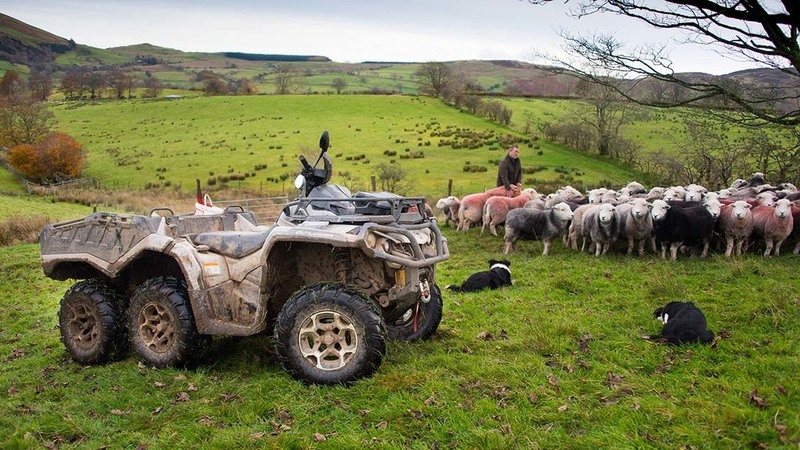 For sheep farmer James Rebanks, a good ATV is an essential tool to manage his prize-winning flocks of Herdwick and Swaledale sheep. Located in the picturesque surroundings of the Lake District, few types of vehicles are suited to the terrain and conditions of Racy Ghyll Farm which comprises steep slopes, wet ground and rocky surfaces. As such, most of the farm’s duties are now carried out by a six-wheeled ATV, sourced from Canadian company Can-Am. “As the farm’s main workhorse, it has to do everything,” says Mr Rebanks. For a long time Mr Rebanks, like many farmers, relied on conventional quads to get the job done. So what attracted him to the six wheel concept? “We first tried a 1,000cc Can-Am prototype six-wheeler about two years ago. That showed us it was a viable option. For the last six months we have run a full production version. With a large load bed, it can handle fencing materials, several bags of feed, raddle buckets and a decent sized spray tank, says Mr Rebanks. However, one of the most valuable cargos carried is Mr Rebanks’ three sheep dogs. “These are worth more to me than any ATV, so it is frustrating ATV manufacturers put little thought into the transportation of dogs. Thankfully, this is an area where the 6x6 scores very highly for Mr Rebanks. “It is like an aircraft carrier for dogs,” he says. For lambing time, the 6x6’s long chassis allows it to be fitted with a sheep carrier at the rear and a lambing kit box at the front. With weight spread over six wheels, and all six wheels capable of driving, less wheelslip and ground compaction is also afforded, he says. “I normally run it in four wheel drive, only really needing six when the conditions get tough. As you would expect, there is one downside with the six wheel concept. Although it does have shielded and heated handlebars, some more protection from the elements would be good, says Mr Rebanks. “But then you would be getting into UTV territory, which means a return back to four wheels. For now, I prefer the capabilities of a six wheeler over the comfort of a cab."